1. To be [drug-free] or not to be [drug-free]? The most tense and difficult negotiations revolved around the ‘modalities resolution’ for the preparations and procedure for the high-level “ministerial segment” scheduled for March 2019. The “ministerial segment” is the moment when member states would essentially need to agree the way forward as the current agreement containing the 10-year “drug-free” targets, the 2009 Political Declaration and Action Plan, ends in 2019. Member states generally fall into two camps on the way forward beyond 2019 – there are those that want to extend and reaffirm the 2009 targets, and those that absolutely do not and instead want to base the next phase of UN drug policy on the UNGASS Outcome Document. This battle between the 2009 agreement and the UNGASS outcome document has been brewing for many months and reached crisis point during these negotiations. In particular, the UNGASS Outcome Document’s progress on human rights is proving to be an anathema to governments firmly wedded to more repressive drug control responses. 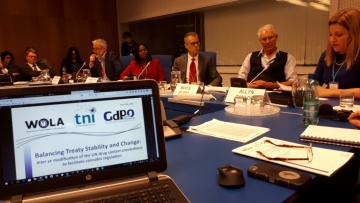 The negotiations on the 2019 modalities started in Vienna a month before the CND meeting and went on throughout the CND week in closed informal sessions without any agreement being found, despite one session going on until 3am and new drafts being produced daily. On the last day, the exasperated Mexican CND Chair finally put a drastically shortened version of the ‘modalities resolution’ on the table which was adopted right at the end of meeting. However, even after adoption, a group of countries led by Russia, gave a statement expressing their displeasure with the process and seemingly rejecting the final draft that had only just been unanimously adopted. The inability to agree what should be a simple procedural resolution brings into sharp relief the emergent and growing dissensus in Vienna. Finally, there was no appetite to outline a proper review or evaluation process on whether progress towards the 2019 targets has been achieved – but this is likely because the answer is obvious but once again illustrates the detrimental inertia of the CND. 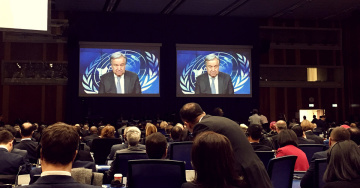 UN Secretary General, António Guterres, addresses the CND Plenary. Photo by Harm Reduction Coalition. The presence and visibility of the Office of the High Commissioner for Human Rights (OHCHR) at the CND was unprecedented, with their representative delivering three statements during the plenary. The previous week in his global update of human rights concerns, the High Commissioner for Human Rights had urged member states “to examine the effectiveness and human rights impact of their current approaches to the so-called “War on Drugs””. A week after the CND, on March 23rd, the Human Rights Council agreed a second resolution that reaffirms that human rights must play a central role in global drug policies. This resolution mandates OHCHR to produce a report that reviews the implementation of the UNGASS Outcome Document with respect to human rights provisions, as a follow up to their pre-UNGASS 2015 report. The International Narcotics Control Board was the firmest it has ever been on ensuring human rights in drug control. This was highlighted in the foreword of their latest report as well as in their statements during the CND session. That human rights is now central to the rhetoric at the CND is an important and welcome development, although the realities on the ground from forced eradication, forced treatment and detention for people who use drugs, extrajudicial killings and the use of the death penalty (to name a few) illustrate that there’s much work to do before rhetoric translates into real change. As a stark reminder of this challenge, the weekend before the CND meeting, President Trump reiterated his call for imposing the death penalty for drug dealers as a response to the US overdose crisis while congratulating Singapore for their approach. Singapore for their part, carried out two drug-related executions either side of the CND week and proudly declared their “clear-headed” policy to be working (although experts have strongly refuted this). Canada and Uruguay tabled a resolution on ‘removing stigma’ given that it presents a barrier to accessing services for people who use drugs. This was a brave move in the CND setting where some governments unfortunately view stigma as positive and necessary as a drug prevention measure. However, after lengthy and contentious negotiations (also going on until midnight on the penultimate day), the resolution was agreed although the title was changed from ‘removing stigma’ to ‘promoting non-stigmatising attitudes’ and some of the initial language was watered down. The resolution may also have faced strong resistance due to political and ideological opposition to the cannabis regulation initiatives taking place in both the original co-sponsor countries. Despite some watering down, this resolution represents critical progress in Vienna and would have been unthinkable only a few years before. The request “to seek opinions and contributions from drug users” in developing policies and programmes was retained in the text and is a crucial step forward in the push for the meaningful and genuine involvement of people who use drugs. Other progressive resolutions adopted include one on the prevention of mother-to-child transmission of HIV and hepatitis for women who use drugs and one on addressing the needs of vulnerable members of society. Unfortunately none of these resolutions explicitly mention harm reduction as this is still hard to do at the CND, however Germany did submit a conference room paper on the “importance of harm reduction for people who use stimulant drugs” to support broadening out the concept which until now has been only accepted at the CND in relation to injecting drug use and HIV prevention. This year it truly felt that the long-standing efforts to improve civil society engagement and visibility at the CND were starting to pay off. The usual tensions between member states and civil society appeared to have worn down to an imperceptible level and the relationship was more symbiotic than in previous years. Many civil society representatives were able to meet with their government delegations and share views and perspectives on resolutions and the debates. In a major win, the adopted version of the modalities resolution made specific mention of the Civil Society Task Force which has been revived to ensure strong engagement in the lead up to the 2019 ministerial segment. 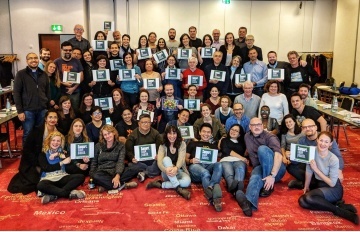 Civil society organisations were also responsible for numerous side events on many challenging issues that still cannot be properly discussed in the main debate such as legal regulation, harm reduction, human rights defenders and the devastating drug war in the Philippines. Crucially, civil society groups continue to bring the voices of the most affected communities to Vienna to give their own personal accounts of how drug policies have affected them directly. These perspectives are an important reality check in what is often a detached and abstract discussion. Dedicated and insistent civil society advocacy for reform has positively impacted the UN drug policy discussion as demonstrated by the UNGASS Outcome Document and the subsequent shift in the tone of the debate. 5. The growing elephants in the room…. The CND continues to be hampered by an inability to genuinely engage with reality and evidence-based, effective responses. The developments happening in the real world, whether its cannabis regulation efforts, the urgent need for drug consumption rooms to reduce overdose deaths or extra-judicial killings committed in name of drug control are barely mentioned in the formal debate. Panel from the side event 'Regulating cannabis in accord with international law'. Photo by Tom Blickman, TNI. On cannabis, Canada once again stated its plan to regulate the market later this year noting that after a century of drug control it remains widely available and that prohibition has not served to protect young people. Several other member states expressed their opposition to regulation (as well as towards decriminalisation). Outside of the formal setting, there were a number of side events on regulation including a prominent one from Colombia on “legal uses and markets for cannabis, coca and opium poppy”, one on regulating coca and cocaine and one on the final day exploring the legal UN treaty tensions of cannabis regulation and proposals for a way forward. In addition, Uruguay held a briefing for NGOs on their national drug policy developments and outlined their cannabis regulation model. There were also side events to highlight the harms and dangers of legal regulation but for now a genuine and honest discussion has yet to materialise in the main discussion. The overdose crisis in North America was also of key concern and strongly highlighted by Canada and the US in their country statements, but their respective responses were very different. The US focused on law enforcement and called for more international cooperation on preventing illicit production and trafficking of fentanyl (also the focus of their resolution which initially did not mention overdose prevention – this was included during negotiations), while Canada talked of rolling out drug consumption rooms to prevent overdoses across the country. Similar to many of the other critical real world developments, the CND has yet to engage meaningfully with the overdose crisis and to move comprehensively beyond failed law enforcement rhetoric towards a genuine focus on reducing harm. This continues to be at the very heart of the ongoing tensions in Vienna, which will make attempts to find consensus on drug policy ever more challenging.